I am so excited Kathleen has returned here today. I love the Chloe Ellefson Mystery Series. It is set in Wisconsin and in the The Light Keeper’s Legacy we travel away from Old World Wisconsin to Washington Island and Rock Island State Park in Door County. It is a beautiful vacation spot and I loved my visit there with Chloe. I will let Kathleen tell you more about it. I love lighthouses too. I grew up on the east coast, and saw many majestic towers along the Atlantic shore as a child. Since moving to the Upper Midwest thirty years ago, I’ve visited a number of Great Lakes lighthouses. Five years ago my husband and I applied to be docents at Pottawatomie Lighthouse, which is in Wisconsin’s Rock Island State Park, off the tip of Door County in Lake Michigan. Both of us have experience serving as reenactors and interpreters at historical sites, and to our delight, we were invited to spend a week living in the lighthouse and giving tours to guests. We loved every minute of it. It didn’t take me long to decide that I needed to get Chloe, protagonist of my Historic Sites mysteries, to Pottawatomie. Writing The Light Keeper’s Legacy allowed me to delve deeply into the history of Pottawatomie Lighthouse and the women who once lived on the island. And spending time in that world gave rise to my initial question: What is so compelling about lighthouses? I have several theories. First, many people love being by the water, and the structures are often situated in remote, rugged, scenic spots. Also, the buildings symbolize maritime history and culture. In addition to keeping the lights burning in often difficult conditions, keepers sometimes rescued stranded travelers or shipwrecked sailors. Perhaps lighthouses encourage us to vicariously experience the challenge of facing the elements on some lonely outpost. How would we have fared? Finally, I suspect that the lights themselves strike a symbolic chord in the human psyche. The lamps were lifesaving beacons on the darkest of nights. By extension, so were the keepers. Who wouldn’t be attracted by the notion of providing a beam of guidance and hope to some forlorn soul? As a writer, thinking about this question led me back to Chloe’s week on the island. As her research progresses she learns more about a real woman who once served as assistant keeper at Pottawatomie Lighthouse. Might past events be linked to modern murder? Since the local deputy sheriff investigating the case shows no interest in considering that idea, it’s up to Chloe to shine the needed light on a long chain of dark events—and in so doing, help solve the crime. So…are you intrigued by lighthouses? If so, why? I’d love to hear your thoughts! I’m grateful to Dollycas for allowing me to be a guest on her blog. And I’m grateful to readers! I love my work, and I’d be nowhere without you. Leave a comment here, and your name will go into a drawing; the winner may choose any of my Chloe Ellefson mysteries: Old World Murder, The Heirloom Murders, or The Light Keeper’s Legacy. For more information see my website, http://kathleenernst.com, or my blog, http://sitesandstories.wordpress.com . 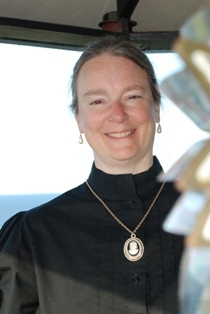 The Light Keeper’s Legacy is Kathleen Ernst’s twenty-fourth published book. In addition to the Chloe Ellefson series, she has written many books for American Girl, including the six-book series about the newest historical character, Caroline Abbott. Several of her mysteries for young readers have been finalists for Edgar or Agatha awards. I always think about how hard the life was, especially in the early years. The keepers must have been tired all the time! I think that is so cool, that you actually stayed there. I have been taking photographs of lighthouses for years. I am a water worshipper, so it is only natural that would include lighthouses. I would love to win the book. Thanks for the giveaway. Good luck, Sherry! There is something majestic about a lighthouse against the water and sky, isn’t there? There sure is. Makes some of the most beautiful photographs. I like the architecture and peeking out the windows to see all that water and think about the wonderful voyages taken. Light houses are pretty intriguing to me. I love all of the stories that I’ve read that include them and one day I’d love to visit and walk through one. Just the architecture alone draws me. Your book sounds great – can’t wait to read it! Wendy, I hope you get to tour a lighthouse soon! Some are restored to a period appearance, and some have been turned into traditional museums, but I find each one fascinating. As for the architecture, Pottawatomie must have seemed like a palace to the local fishing families who lived in tiny cottages or cabins. Lighthouses have intrigued me since I can remember, My husband and I have seen most of the lighthouses in Wisconsin, including the one in Door County mentioned here. We have also seen quite a few in Michigan, Florida and North Carolina. The life of a lighthouse keeper and the family seems like it would be a rewarding but desolate life, especially in winter, but knowing that you are guiding the ships from harm would be rewarding. Plus living by the Great Lakes or an ocean would be awesome. Thank you for a great review and interview. Hi Kathleen – I haven’t visited any lighthouses in Florida, but I hope to one day! So many stories from the Great Lakes are about cold wintry weather, but I imagine the Floridians had to contend with hurricanes. Not an easy life either way. I have never been in a lighthouse but it is something that I have always wanted to visit. The books sounds like it is one I would really enjoy. Thank you for letting us share in it. Thanks, Lesley! Good luck in the drawing. What a great sounding book, I can hardly wait to read it. Thanks, Wendy! I hope you enjoy meeting Chloe. I love reading mysteries regarding lighthouses- especially when they are historically accurate. This sounds very intriguing and I am looking forward to reading more. Thank you for the info regarding the author and the book. Amanda, I’m with you – if I’m reading about something historical, I want the real thing! One of the things I love about writing this series is being able to dig deeply into the history of such fascinating places. I love lighthouses and have visited most of them in Michigan. I have pictures of most of them and small likenesses of all that I could collect. I would love to read a book where a lighthouse plays an important part of the story. Mary Ann, I’ve visited a few in Michigan, but have more to go! Thanks for stopping by, and good luck! Having read and owning The Heirloom Murders I just know that I’d enjoy this book immensely and that it would fit right into the shelves of my home library. I have a collection of photos I’ve taken of my vacations in New England of many lighthouses. It’s my favorite thing to photograph. Nora-Adrienne, I’m so glad you enjoyed The Heirloom Murders! I recently visited my first Maine lighthouse, the Portland Head light. Quite spectacular when viewed from a bit down the rocky shoreline. Terrific post, thanks! And what nice photos as well. You must have had such a great time as docents at that beautiful place. My wife and I would love to have a chance to get involved in the Chloe Ellefson mysteries. Thanks for the giveaway. Thanks, Carl! My husband and I have been docents four times, and we absolutely love it. Good luck in the giveaway! Thank you for the opportunity to win one of your novels. I’m glad to be here! Good luck. Good luck, Victoria! Hope you get to tour a lighthouse one day. Lighthouses give a book such an old-time feel—and I can almost smell the water when reading about them. I think I’d enjoy this book very much. Sue, there is something evocative about them, isn’t there? Just the image brings all of our senses to life. I love the history of the lighthouses. They are so pretty. I have never got a visit a lighthouse. Just saw many things about them on TV. I have been to Old World Wisconsin. That was really interesting. Thanks for the giveaway. Sue, Old World Wisconsin is a great place, isn’t it? I plan to have Chloe visit a number of other historic sites as the series progresses, but I want to keep her rooted at OWW. I am fascinated by lighthouses. Good luck in the drawing, Lisa! I just spent part of last weekend with friends who love lighthouses. They live a lot closer to the ocean than I do. I do love mysteries and history as I have been around re-enactors. I love the idea of spending a week at a lighthouse. Rachelle, as a former reenactor and historic site interpreter, serving as a docent is very satisfying. This looks like a good book. Thank you for the chance to win it. I have seen the lighthouse in Key West, Florida. It was interesting. My Mom and I shared a love for lighthouses. I think in the past,especially, the work must have been tense helping the boats and ships find the shore. It is still in the best interest for the shore to be seen using a lighthouse right? I do not want to be sad,however,when my Mom died in 2009,Dad and my Sister picked out a beautiful box for Mom to come home to us and the Lighthouse is on the front with the water and birds and shore all in a color picture in the shape of an oval. They have a special meaning,certainly! I love the synopsis,interview and the post about a must-read book for me. It is on my list to read on Goodreads. Thank you for the giveaway too. Cyndee, what a special memory and tribute to your mom. Thank you for sharing. As for your question, at Pottawatomie, a solar-powered light on a metal tower has replaced the old lamp. Even though modern sailors have plenty of technology to aid them, they still (I’m told) want the lights as backup. I love lighthouses. Have only been in one and it was a regular one. Would love to win. Thanks for entering, Nancy! Good luck. I grew up in Duluth, MN in the 40s and 50s and if I shut my eyes real tight on a rainy night and concentrate I can still hear the Split Rock Lighthouse foghorn! I loved that sound. It brings back so many memories. We visited the lighthouse many times during those years. I have your book on my wishlist. Karen, I love the image you conjured. I haven’t toured the Split Rock light, but I’ve seen it–gorgeous! And once I was staying at a friend’s place in Michigan’s upper peninsula when the foghorn started sounding. I felt as if I was hearing something that stretched back in time. I’ve always wanted to stay in a lighthouse! I can imagine the history that lives in every lighthouse. I have always been fascinated by lighthouses! I read a book to my daughter when she was young about a girl who lived in one. I can’t remember the name but it was delightful! I can’t wait to read this wonderful book! Thank you so much for sharing this! Hi Christy – perhaps the children’s book was about Abbey Burgess, a young woman who kept things going at a Maine lighthouse during a terrible storm…? I’ve read a couple of great books about her. Thanks for commenting! We don’t have too many lighthouses here in California. I’ve always thought they were beautiful. Linda, I admit I haven’t had a chance to visit any lighthouses on the west coast. Maybe someday! I’ve only ever visited one lighthouse & it was not very remote at all. Lighthouses do hold a kind of mystique about them them. Mary, when I visited a Maine lighthouse last weekend I was initially shocked to see tour busses sitting in the parking lot! Very different than the remote Pottawatomie, but the museum inside was great. Lauren, Montauk is on my to-visit list! Sounds like a fascinating place. While I’ll miss Old World Wisconsin, the lighthouse setting sounds great. I think they have such a history in the seafaring world and they always seem to be such beautiful constructions. I think lighthouses make the mind imagine. I think they are beautiful set by the water.With the sky reflecting off the water at night, the sunset, or rain or sun shine its a gorgeous sight. What better place for a mystery. I love the shape of lighthouses, and the beacon light, and its powerful foghorn. I have never been inside one, but perhaps someday. This all makes for an intriguing setting for the mystery stories we all love. Looking forward to the new book. Thanks for the contest! I just finished Lighthouse, and I loved it! – now I am talking with a friend about the trip to that lighthouse next summer. I saw the beautiful lighthouse at Point Loma, CA. I think they all have a sense of mystery. Love to look at them, so many different kinds. How can anyone not fall in love with a lighthouse? I would I look forward to reading this book. Thanks for the chance to win a copy. 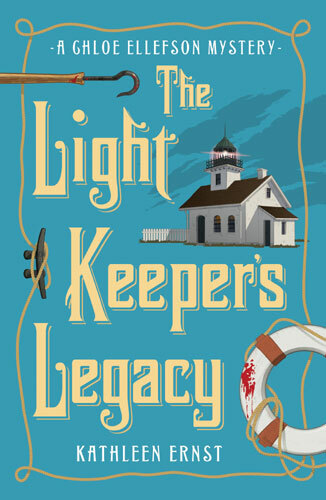 The Light Keeper’s Legacy is a very enjoyable book, but the first is still my favorite. Probably the fascination that I had as a kid when I visited the Cape Hatteras and Ocracoke lighthouses along with the pirate and water rescue stories led to my continued interest of the lights. They are also great photographic subjects. I’m looking forward to the future adventures of Chloe and the person she is with at the end of The Light Keeper’s Legacy (don’t want to spoil anything). There’s something majestic and solid about them, maybe a sense of safety if you were in danger. But then what if it wasn’t a place of safety? They bring to mind all kind of ideas. Kathleen Ernst is a new author for me, but a good friend had introduced me to her books. As a resident of Michigan I’m a lover of lighthouses and lighthouse fiction. Thank you for this interview and offer to win Kathleen’s book! I’v always been intrigued what it would be like to live in a lighthouse. I loved the movie “Pete’s Dragon” with Helen Reddy and Micky Rooney! Ever since that movie I wanted to see one and go up to the top, look around. And if by water, ocean, lake, look out over. I’ve never had the opportunity to visit one. When I read Rock Island my first thought was the city by me here in Illinois. Now that I’m disabled I don’t know if I will ever be able to see a lighthouse only read about them. I would love to read the book “Light Keeper’s Legacy”! You are so lucky to spend a week in the lighthouse giving tours. Sounds like a cool story. Thanks for the chance to win this awesome book! Hope I get the chance to read it!